Discover comfort in spacious accommodations featuring a king size bed, queen size sofa bed and full bathroom with garden tub and complimentary amenity kit. Enjoy the convenience of the full kitchen equipped with a refrigerator, microwave and dishwasher among many other essentials. Additional in-room amenities include cable/satellite television, DVD player, telephone and balcony/terrace. Driving: From I-95: Take the US-92/International Speedway Boulevard (exit 261), head East toward Atlantic Avenue (6 miles) and turn left heading North on Atlantic Avenue The Daytona Beach Regency is approximately one mile on the right hand side. Directions to Resort: Head south and bear left at Catalina Drive. Continue toward Midway Avenue. Bear right at Midway Avenue. Turn right at West International Speedway Boulevard and head toward Daytona Beach (US-92 East). Turn left at South Atlantic Avenue. Continue on North Atlantic Avenue. Arrive at 400 North Atlantic Avenue, Daytona Beach, Florida 32118. Details: ADA pool lift is available upon request. Housekeeping Service: Daily housekeeping service available for a nominal fee, please contact the front desk reception upon your arrival. There is a construction project taking place through to Fall 2019 in the lot next to the resort. Guests may experience a certain level of noise and dust and will see construction workers and equipment as the work progresses. - The Daytona Beach Regency team are looking forward to serving you and are eagerly anticipating your arrival. Every effort will be made to insure that you have a pleasant visit with us and that you have the best view of the beach and ocean as possible. Unfortunately, due to the design of the building, our resort has a very limited number of suites with a direct view of the beach/ocean and as such not every suite has a direct view. Every attempt will be made to accommodate requests for suite location and early arrivals but these requests are not guaranteed and are based on availability and occupancy. Accordingly, we want you to know that we will do our very best to insure that we provide world class service and do all that we can to make you comfortable during your stay with us. - All reservations that have an alternate guest checking in should make prior arrangements with the Daytona Beach Regency Front Desk. - No pets are allowed (strictly enforced) with the exception of Service Animals (i.e. Seeing Eye Dog). - You must be at least 21 years of age to check -in. - Parking at our resort is very limited and is restricted to one vehicle per reservation. Any additional vehicles, oversize vehicles, recreational vehicles or trailers are required to park off property. Our Front Desk can provide alternate parking locations and rates. Visitors of guests must register with the Front Desk in advance and offsite parking for visitors may be required. - There are limited areas at the resort where smoking is permitted. Please note that smoking is strictly prohibited in the suites and pool areas including the sundeck, tiki bar and grilling areas. For our guests that do smoke, please note that smoking is permitted on the balcony of the suites and in limited areas around the resort. - Hotel Guests and Exchange Reservation: A photo identification, credit card for $100 security deposit and a nightly $21.95 plus tax resort fee will be required (cash is not an acceptable form of deposit). Resort Fee includes Wi-Fi, indoor and outdoor pools with water slide, hot tubs, game room, BBQ grills, fitness center access, and business center access (computer/internet and boarding pass printing). - Owner Weeks and Member Points Booking: Photo Identification and credit card for security deposit will need to be provided at check-in. Resort fees will be waived when staying on your owner week or member point reservations. A resort fee of $21.95 plus tax per night will be added to the reservation if the owner or member of THE Club® is checking in on a rental reservation. 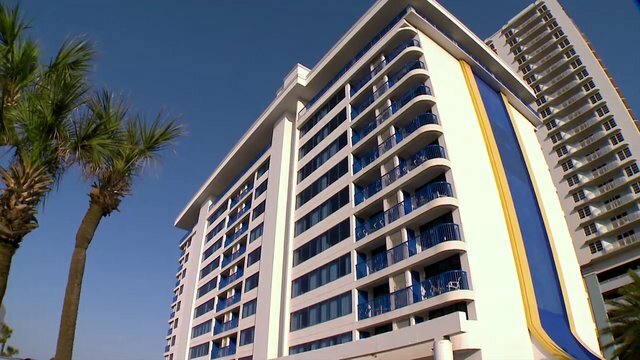 Highlights: The Daytona Beach Regency, in the heart of Daytona, is 100 feet from the beach. Great nightlife, movies, shopping, and fun awaits you.